The second in the THE GUARDIANS series features Annika, a mermaid, and Sawyer King, a descendant of sea-faring time-traveler. They, along with four others, have banded together to conquer evil and return three stars to where they belong and forever out of reach of the darkness. Annika is a pure soul who is new to the world above the water; she delights in nearly all she encounters and loathes to harm anyone, but she will do her part to defend the stars from falling into the wrong hands. While she does, she wouldn’t mind being in Sawyer’s hands, at least for as long as she’s allowed above the sea. Sawyer is enchanted by Annika and her joyful ways, but knows getting close to the mermaid will only lead to heartache in the long run. After all, theirs would definitely be a relationship that would be doomed to end sooner rather than later. Nerezza, the evil one, broods, already having lost one of the stars to the strange band of strangers, and works to make sure losing the other two does not happen, even if she needs to ensnare the help of another human, even if she needs to make him a little more than human to ensure he succeeds against the guardians. 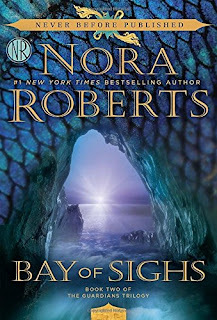 This series features a number of new paranormal elements not usually encountered in a Nora Roberts’ novel (at least not all at the same time): a witch, a seer/prophet, a mermaid, a time-traveler, a werewolf, and an immortal. While this might appear to be a disparate group of elements, and while the story seems to draw from about three or more different fairy tales before spinning off into something new, it works; and it’s all held together with classic Nora Roberts’ banter, suspense and unique characters. I wasn’t sure I would enjoy this trilogy like I had many of her previous ones that dealt almost exclusively with only one main element of paranormal at a time, or at least an alternate lifestyle (i.e. Wicca); however, I couldn’t put it down and I enjoyed it immensely. I look forward to reading the third in this series and learning how the guardians finally defeat the darkness forever. Great review! I was glad to read your take on it because I was hesitant to read it. I've been putting off starting this series because of all the paranormal aspects. When I saw the book yesterday I wondered about it ... Guess I'll be getting the first one to start. I haven't started this series yet either, Nikki though I have enjoyed Nora's paranormal books in the past. Hellie's review makes me want to give it a try. I totally understand the hesitation, but I think once you get started you won't be able to put the book down. Hope you're feeling better!! I can't imagine not liking any book by Nora - sounds good to me! Thanks, catslady. I'm still weak as a kitten but I'm starting to see glimmers of light at the end of the tunnel. I ended up in the ER in Ohio but they gave me good meds that seem to be finally taking effect. Thankfully, I had a friend with me who was able to drive us home. The doctor restricted me to four hours a day in the car with at least 30 minutes out of the car every two hours so it took us a while but I'm finally home and it feels so good! Hopefully, I'll be up to full speed by next week or the week after. Eeek, PJ, I wondered how you were doing. I was gone all day yesterday and didn't realize you'd posted my review...but am so happy to see you around even if you're not at full capacity yet. Ha, catslady! I know what you mean--I didn't always read Nora's books but now that I do, I feel that way. I haven't started the series yet, but read all of Nora's stories - I've been less enamored of a few of her paranormal series, so glad to hear you liked this one. There are some of her paranormal series I've really liked--the really dark ones *LOL*, like the one about the Pagan Stone and the one that basically takes place in an alternate world (fairy land), but this one is not bad. I love Nora Roberts but was not sure I wanted to read this series. I should have know better. Will have to start reading this soon. *LOL* I know what you mean. I kinda felt that way about the screen play about Harry Potter. I LOVE all Harry Potter, but I hesitated about the book because I didn't want to put out money for it and then not like it. Within 15 minutes I realized this was a foolish thought. *LOL* I think this is the same. It's definitely worth a read--but if you decide to get it from the library (like I did for the Harry Potter play), I think you will enjoy it just as much! I hope you made it back home safely and are feeling better.